The astrophysical ESFRI projects will generate rich and complex, multi-dimensional datasets, and the exploitation of this unique combination of astronomy "Big Data" requires a common data infrastructure for data discovery , access and interoperability. 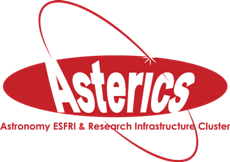 ASTERICS aims to maximise software re-use and technology co-development for the robust, scalable and flexible handling and exploitation of the huge data streams and distributed petascale database systems associated with the ESFRI facilities - identifying best practice, defining open standards, design patterns and benchmarks, generating prototypes, constructing use-cases, and optimising frameworks and software libraries in an open innovation environment. The Virtual Observatory (VO) has been incredibly successful in integrating distributed infrastructures into one single virtual astronomy facility - the diversity of the various multi-messenger ESFRI facilities represent the obvious next step forwards. By ensuring that the ESFRI telescope products are openly accessible via the VO framework. ASTERICS wants to adapt the VO framework and tools to the ESFRI project needs, gathering requirements from the community and making the data interoperable in a homogeneous environment, enabling discovery and re-usage by the entire astronomical community and accessibility via a set of common tools and standards. LAPP/CNRS wanted to realise a data format generator for High Performance Computing (HPC) from a simple configuration offering greater flexibility and a shorter development time, with respect to existing generators. CASA (Common Astronomy Software Applications) allows easy distribution of processing on conventional HPC clusters through the use of a shared file system, and was able to scale CASA up to the limits of storage throughput required by SKA with “SWIFTCASA"
CTA telescopes have cameras made of over a thousand photomultiplier pixels to capture Cherenkov light induced by gamma ray or cosmic ray particle showers in the atmosphere. To reconstruct shower images with the best precision, we used wavelet filtering. The Virtual Observatory (VO) allows researchers to easily use astronomical data from instruments around the world and to use the VO’s tools on this data. ASTERICS works on preparing ESFRI facilities’ data for the VO and on training scientists. We developed several Open Access libraries for astronomical and astrophysical data: CORELib, ROAst and BeeGFS on SOC. The ionosphere disturbs the radio signals detected by radio telescopes and causes blurred images. We developed a new gridding procedure using parallel processing to correct for ionospheric effects. Compression of data can solve the technical constraints of the large amounts of data produced by research infrastructures. We have developed a new lossless data compression. In astronomy and astroparticle physics, software and data need to be preserved over long periods. Solutions based on container images can be helpful in this.